Most people don’t think twice about getting in the driver’s seat. In 2017 over 37,000 people died in motor vehicle crashes in the U.S. – more than 100 deaths each day. While various reasons contribute to the death toll, driving under the influence of alcohol caused one death every 48 minutes in 2017. We also know that more drunk drivers get on the road during the holidays, a grim fact that contributes to a higher risk of fatal collision for all of us. So which holidays should we be most wary of, especially for travelers on the road? We analyzed data from the Fatality Analysis Reporting System (FARS) from the National Highway Traffic and Safety Administration (NHTSA) from 2013 to 2017 to examine holiday-related fatalities in America and how the data have changed over time. Using the FARS “Holiday-related” variable, we were able to understand the effects that a holiday has on traffic fatalities for the week. There’s much to celebrate and remember throughout the year, but drunk driving isn’t one of them. Most Americans know holidays like Independence Day and New Year’s Eve are heavily associated with alcohol consumption. But while drinking on Martin Luther King Jr. Day or Columbus Day might not seem appropriate, a significant number of alcohol-related crash fatalities occurred because of these holidays. While Independence Day and New Year’s Eve and New Year’s Day made up around 36 and 35 percent respectively, of holiday-related crash fatalities involving alcohol, over 33 percent occurred on the week surrounding Martin Luther King Jr. Day and 29 percent during Columbus Day week. Though these holidays may not have the booze-forward traditions of New Year’s or the Fourth of July, the fact that both of these days fall on a Monday may give us some clues as to why alcohol-induced crash casualties are higher than one would imagine. 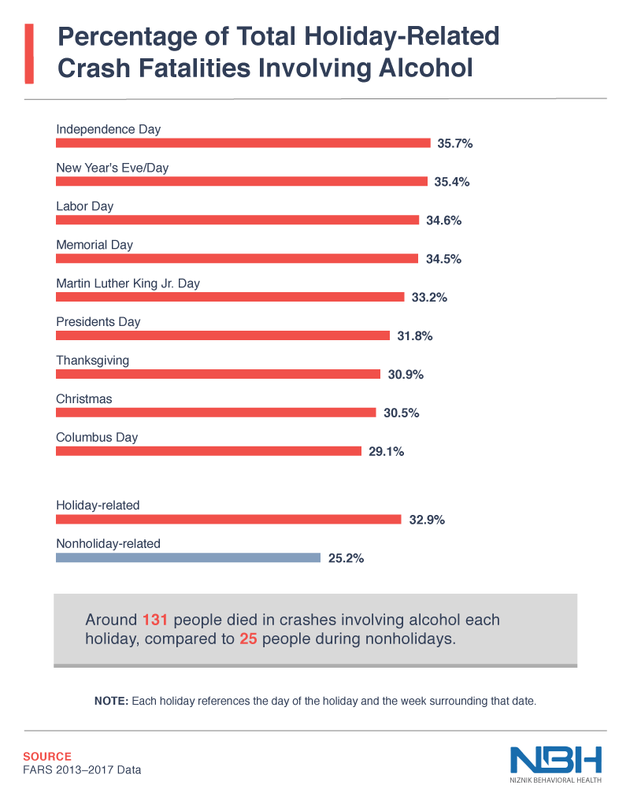 As we saw earlier, there are more alcohol-related deaths attributed to holidays compared to your typical day. This may not come as a surprise, considering the effects of alcohol combined with driving paint a grim picture. Independence Day had the largest total of monthly fatalities, making up almost 15 percent of all crash deaths in July. Of those fatalities, 6 percent involved alcohol – again, the most of any holiday. While Independence Day has a dangerous effect for drivers around that time, Memorial Day and Labor Day are the deadliest weekends to drive. In September from 2013 to 2017, 13.3 percent of driving fatalities for the month occurred during the week of Labor Day, with 5.1 percent involving alcohol. The same percentages were found for Memorial Day, with the only difference being the month in which the deaths occurred. Holiday crash fatalities involving alcohol during Memorial Day and Labor Day week actually decreased between 2013 and 2017. Deaths on Memorial Day decreased by 9.2 percent compared to 2013, while deaths during Labor Day-related days decreased by almost 28 percent. New Year’s Eve and New Year’s Day, on the other hand, saw a 56.5 percent increase in drunk driving deaths over the same period. While that percentage increase is startling, the increase in crash deaths on Christmas is even more shocking. From 2013 to 2017, crash fatalities involving alcohol on Christmas increased by 162.5 percent. While this may suggest Americans are increasing their alcohol consumption during Christmas, the increase in deaths could also be, in part, due to the time of year. The risk of dying in car crashes increases during the summer, especially for teens, but car accidents also increase during the winter months. Fatal car crashes increase when icy roads and poor visibility are added into the equation. 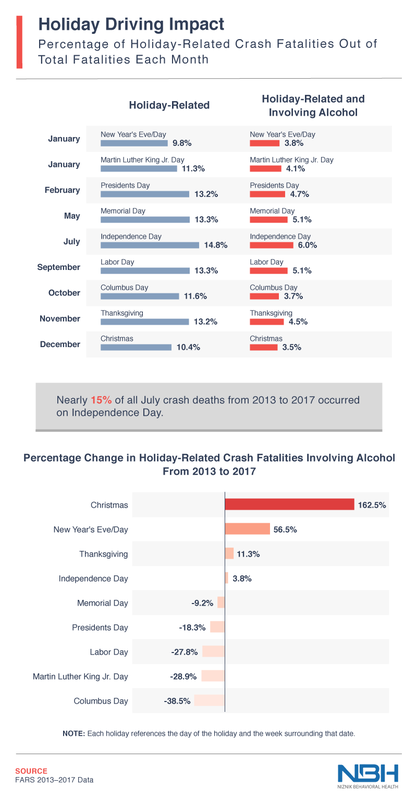 The increase in crash fatalities may have brought Christmas to the forefront, but Independence Day remains the deadliest holiday overall. With an average of 472.2 fatalities on Independence Day, almost 190 involved alcohol – nearly twice as many as New Year’s Eve and New Year’s Day. Labor Day, Memorial Day and Thanksgiving also had significant death rates, with each holiday averaging over 400 crash fatalities overall. In terms of alcohol-related fatalities, Labor Day had almost 160, followed by Memorial Day with 155.4 and Thanksgiving with 138.2. So where are these holiday-related crash deaths occurring? Not always in the states with the highest alcohol consumption. While New Hampshire topped the chart for consuming the most alcohol, when it came to the holidays, it was the safest state in America with the fewest crash fatalities per 500,000 residents; New York and Delaware closely followed. 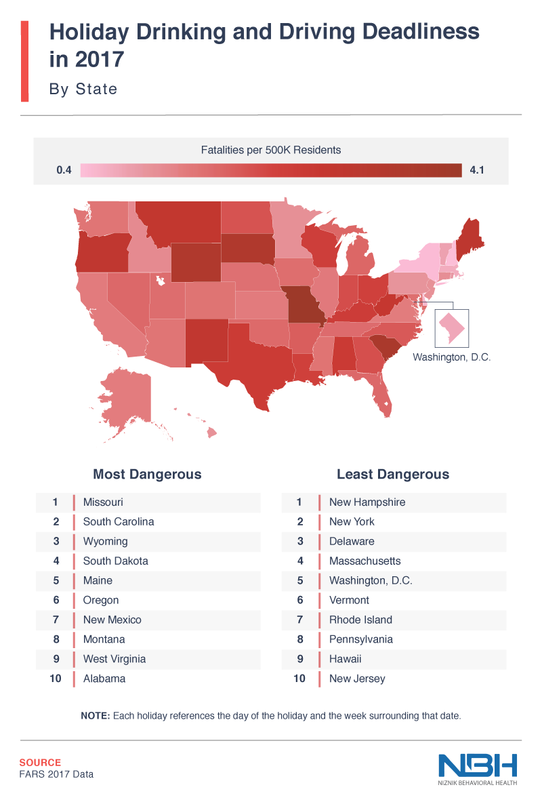 Missouri, however, had the highest number of fatalities, followed by South Carolina. 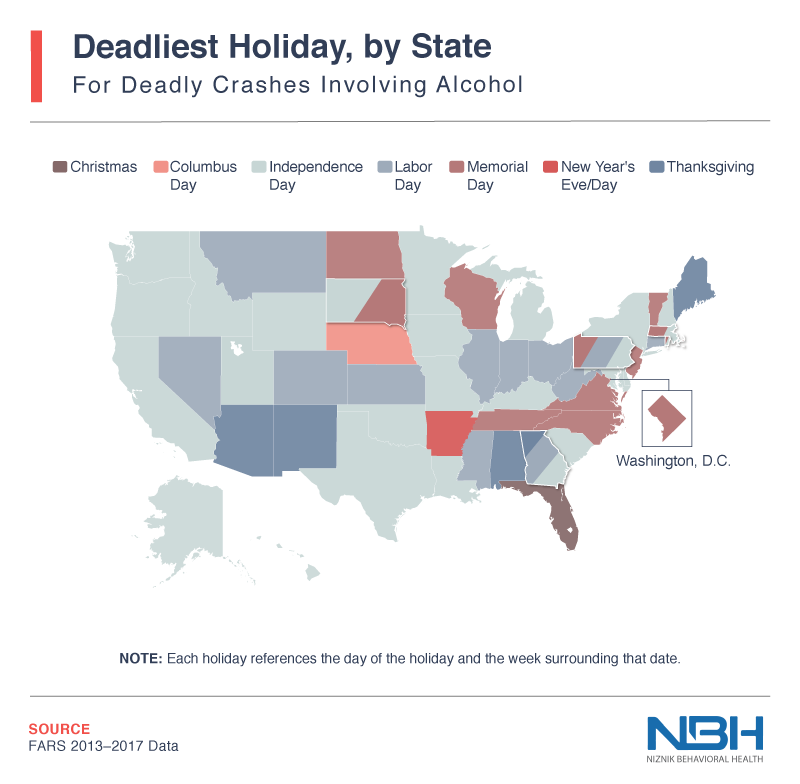 For many of the deadliest states for holiday-related crash fatalities involving alcohol, Independence Day was the riskiest holiday while Christmas was the deadliest holiday in Florida from 2013 to 2017. While winter weather can contribute to driving fatalities around Christmas, that certainly isn’t the case in Florida. A rise in traffic fatalities in Florida around Christmas could have something to do with the fact that this is a popular time of year for people to travel to Florida to avoid the wintry weather in other parts of the country. In Nebraska and Arkansas, however, the deadliest holidays were Columbus Day as well as New Year’s Eve and Day. Holidays are supposed to be a time for celebration and relaxation, but with Americans’ tendency to bring alcohol into the mix, these days can turn deadly. Drinking and driving kills thousands of people each year, but this death rate increases dramatically during the holidays. Compared to an average day, crash fatalities involving alcohol increase about five times during holidays. While Independence Day is by far the deadliest, there has been an increase in crash deaths on Christmas week over the past few years that should be of concern. With just one drink being enough to impair a person’s ability to drive safely, grabbing a ride with a friend, calling a taxi, or using a ride-hailing service is always the best choice. If you or someone you love finds it difficult to stop at just one drink, it may be time to seek help. Drinking around the holidays can be a slippery slope according to our data, but at Niznik Behavioral Health, we’re here to help reroute you to recovery. We are committed to providing you with the highest quality care, individualizing your journey to ensure lasting sobriety. For more information, visit us online today. We analyzed data from the Fatality Analysis Reporting System (FARS) from the National Highway Traffic and Safety Administration (NHTSA) from 2013 to 2017 to explore holiday-related crash fatalities in America. 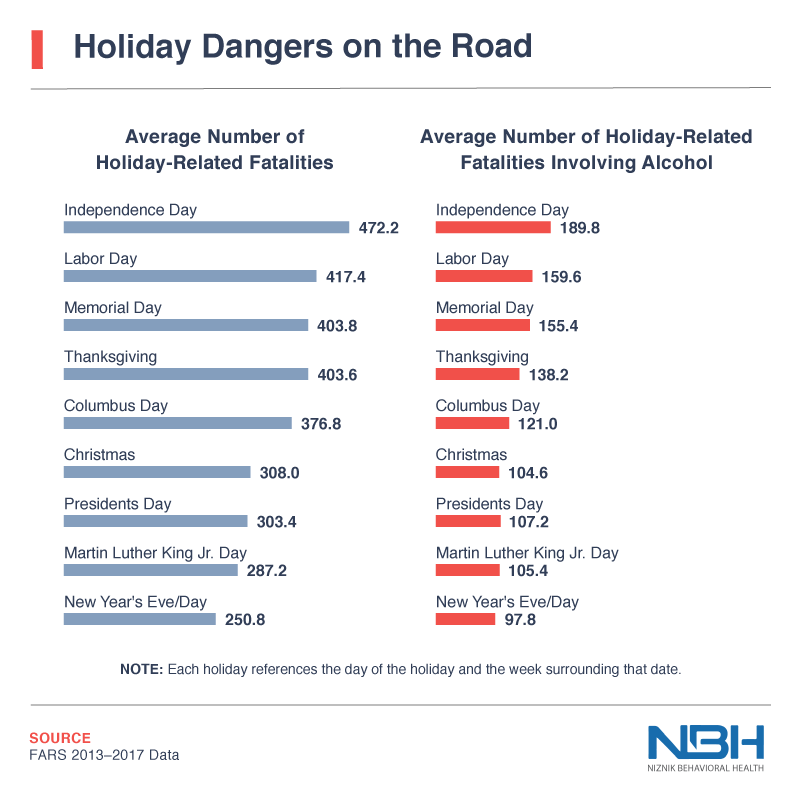 Our holiday analysis used two key variables in FARS, holiday-related” and “driver alcohol-involvement,” to understand the deadliness of drinking and driving across nine holidays. When we investigated the meaning of “holiday-related” factors, we found that it referenced nine holidays, including New Year’s Eve and New Year’s Day, which we combined for analysis purposes. “Holiday-related” also describes the deadly crashes and fatalities occurring that week, approximately five or six days surrounding the actual holiday date. When referencing holidays in this campaign, we referenced the time frame parameters of each holiday created by FARS. Thinking about taking a road trip this year to celebrate the holidays? Safety is important, so please share our study that examines the impact of holiday drinking and driving with friends and loved ones – for noncommercial purposes only. Link back to give us credit for our work.